The monovalent and bivalent derivatives of the BC2 peptide-tag Nanobody, which are discussed in the publication Virant et al (2018), are available from ChromoTek. The Spot-Tag Nanobody is marketed using the product names Spot-Label, when conjugated to a fluorophore, or Spot-Trap, when conjugated to a solid matrix. The affinity of the referenced Nanobody respectively Spot-Label/Spot-Trap to the advanced Spot-Tag peptide is significantly higher than to BC2 peptide-tag and therefore further reduces background. What are the differences between BC2-Tag and Spot-Tag? As a result, the Spot-Tag Nanobody has a higher affinity to Spot-Tag than to the BC2 peptide-tag. Why should I use Spot-Tag instead of BC2-tag? Because the Spot-Tag peptide is preferentially bound with low nanomolar affinity by the Spot-Tag nanobody. Where can I obtain Spot-Tag peptide expression vectors? Where can I buy monovalent (mono)BC2-Nb and bivalent bivBC2-Nb Nanobody in Virant et al? What are corresponding ChromoTek product names that are referenced in Virant et al (2018)? More Spot-Label conjugates with additional fluorophores will be launched. Please inquire for updates (support@chromotek.com). Does BC2-tag or Spot-Tag create background in immunofluorescence microscopy? No – Background is caused by the Nanobody binding non-specifically to other proteins or peptides. 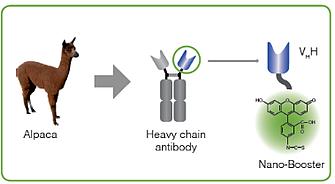 Spot-Tag is a peptide that binds with an up to 10-times higher affinity to the Nanobody than the BC2-tag. As the anti-BC2 Nanobody was originally generated against beta-catenin, Virant et al (2018) have assessed the background staining of endogenous beta-catenin. The authors conclude that the BC2-epitope of beta-catenin has only a minor impact on imaging BC2-tagged proteins. Due to its superior binding to the Spot-Tag, the Spot-Tag Nanobody causes even less beta-catenin-derived background staining when working with Spot-tagged proteins. This is strongly supported by ChromoTek’s imaging data, in which no background from endogenous beta-catenin was observed. Where do I find more information about the Spot-Nanobody? Can Spot-Tag and Spot-Tag Nanobody be used for STED, too? Yes, Spot-Tag and its Nanobody can be also used for STED SRM technologies. Below see two STED images using Spot-Label594, i.e. anti-Spot-Tag Nanobody, bivalent, NHS conjugated to Atto594: HeLa cells expressing Vimentin-Spot-Tag (left) and HeLa cells expressing Actin-Chromobody-Spot-Tag (right) were immunostained with anti-Spot-Label594 (1:1000). Gated STED images were acquired with a Leica TCS SP8 STED 3X microscope with pulsed White Light Laser excitation at 590 nm and pulsed depletion with a 775 nm laser. Objective: 100x Oil STED White, NA: 1.4. Pixel size: 21 x 21 nm; z-Step size of z-Stacks: 0.16 µm. 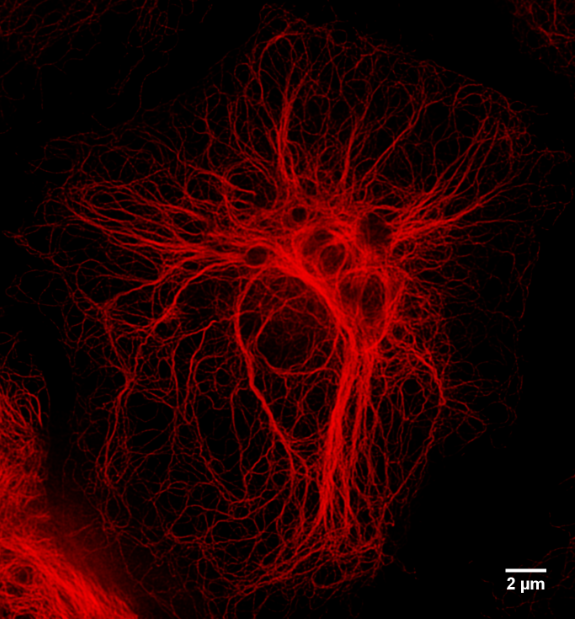 Images were deconvolved with Huygens Professional (SVI). STED images were recorded at the Core Facility Bioimaging at the Biomedical Center, LMU Munich. 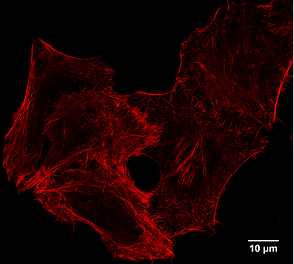 Why are Nanobodies particularly well suited for imaging applications? The anti-Spot Nanobody conjugated to a fluorophore is called Spot-Label and has the smallest epitope label displacement, also called linkage error, of all antibodies when labelling a target. This is of particular importance for SRM imaging. In addition, Spot-Label has a superior tissue and cell penetration rate compared to IgGs. Is Spot-Tag validated for other applications than IF? – What applications can Spot-Tag be used for? What Literature has already been published? Braun, M. B. et al. Peptides in headlock – a novel high-affinity and versatile peptide binding nanobody for proteomics and microscopy, Sci. Rep. 6, 19211; doi: 10.1038/srep19211 (2016).